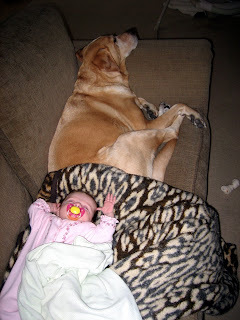 Here's a pic I snapped of Bella and Lily taking a snooze on the couch this morning. Lily commonly sleeps with her arms above her head! We had a great time at the Moody Gardens Aquarium today! Our favorite exhibits were the penguins and the seals. They can sure fly through the water and are so fun to watch! I wonder who said that, I think that I have the most beautiful grand daughter and the most beautiful grand dog in the world, hmmm... such mysteries. Cool! Did Lily enjoy it? I bet she liked watching the colorful fish. We're taking Carina camping tomorrow. Wish us luck!